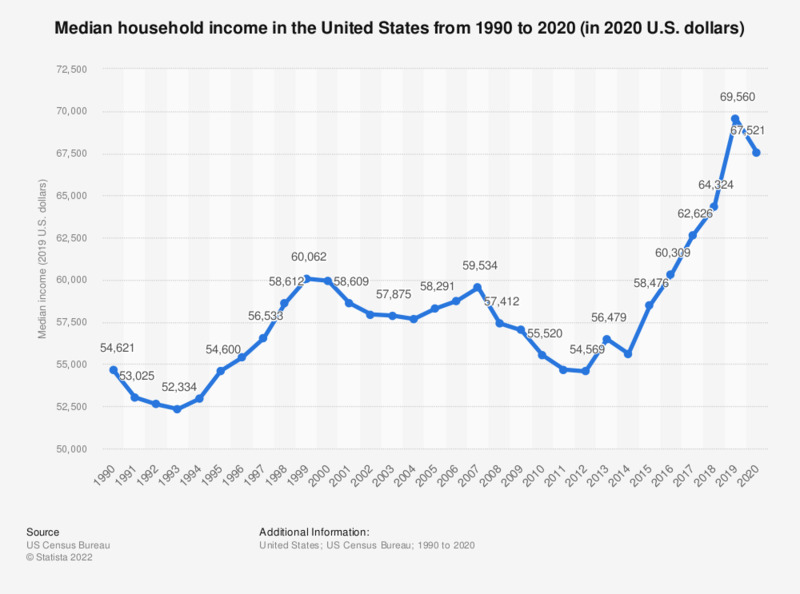 The statistic shows the median household income in the United States from 1990 to 2017. The median household income was 61,372 U.S. dollars in 2017. The median household income depicts the income of households, including the income of the householder and all other individuals aged 15 years or over living in the household. Income includes wages and salaries, unemployment insurance, disability payments, child support payments received, regular rental receipts, as well as any personal business, investment, or other kinds of income received routinely. The median household income in the United States varies from state to state. In 2017, the median household income was 83,382 U.S. dollars in New Hampshire, while the median household income in Mississippi was approximately 43,441 U.S. dollars at that time. The state with the widest gap between the rich and the poor was New York, with a gini coefficient score of 0.51 in 2016. The Gini coefficient is calculated by looking at average income rates. A score of zero would reflect perfect income equality and a score of 1 indicates a society where one person would have all the money and all other people have nothing.